We had a great time with the senior couples who were able to come. 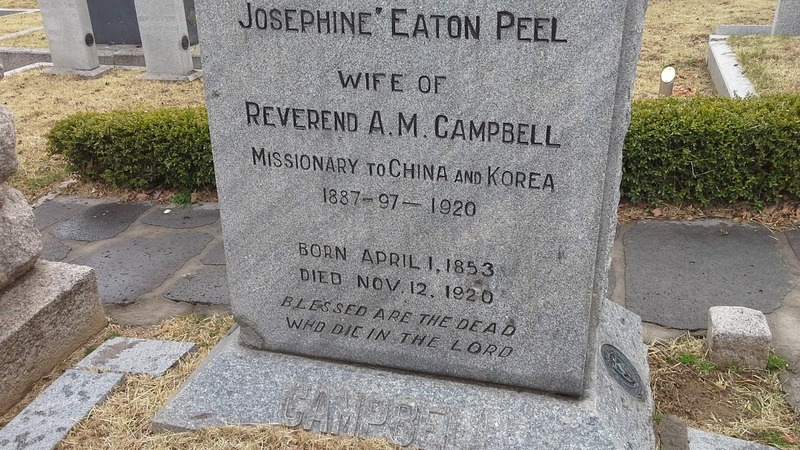 This week we had the opportunity to go visit the foreign missionary cemetery. It is by the river in the middle of Seoul. One of the young men in our branch did an Eagle Scout project here a while back but we were unable to go that day. So, the Nielsons arranged a group tour for the senior couples. It was my first outing other than church and the office and it entailed more walking than I'm used to these days. But it was a great opportunity to visit with the other missionaries and to honor the early missionaries to Korea. 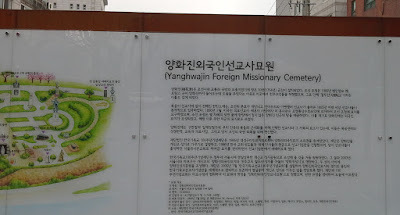 The first Christians came to Korea (or Joseon as it was called then) in the late 1800s. 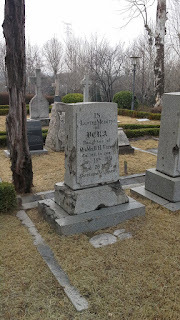 H G Underwood came to Korea in 1885 at the age of 26. He translated the Bible into Korean. 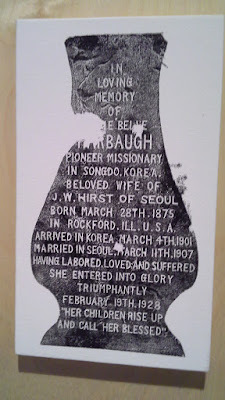 Others came to work with orphans and establish schools and hospitals. 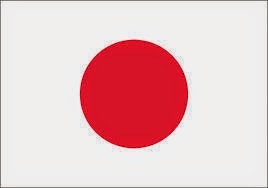 They willingly exposed themselves to the difficulties of living in difficult circumstances in a foreign land. 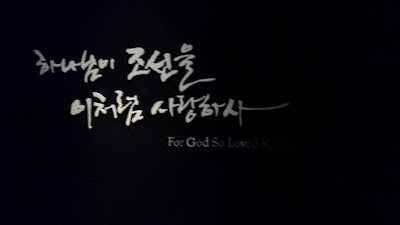 The sign inside the museum says "For God so Loved Korea"
This is a depiction of one of the headstones. The weather turned a bit nasty, but it was still a beautiful atmosphere overlooking the Han River. There is also an area with children's graves. 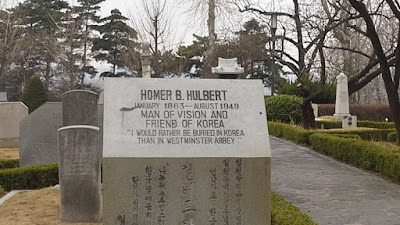 "If I had a thousand lives to give, Korea should have them all"
"I would rather be buried in Korea than in Westminster Abbey"
The love and dedication of these pioneers is amazing! 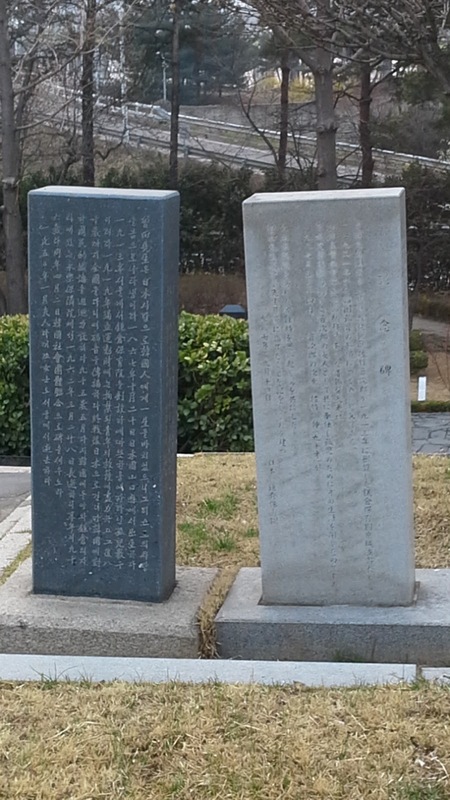 Some of the headstones have signs of damage that occurred during the wars. 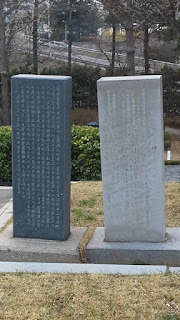 There is only one Japanese person buried here, Soda Gaichi. He became a Christian after having been helped by Lee Sangjae of the Korean YMCA. He then dedicated his life to helping Korean orphans. 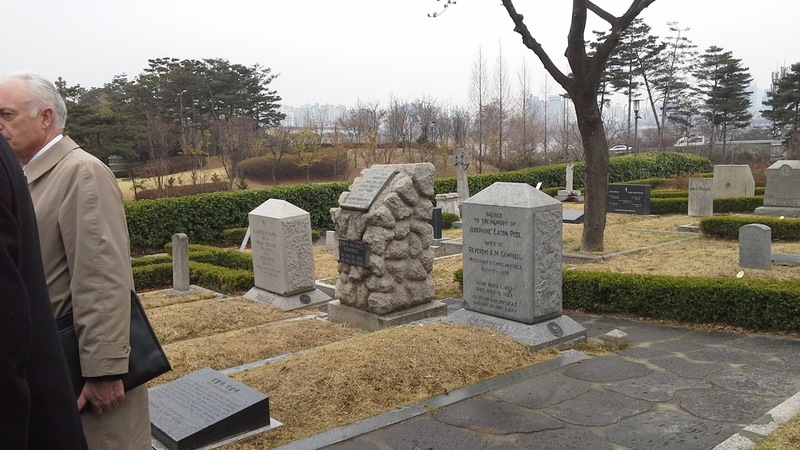 These flags represent the nationalities of persons buried here. USA, Sweden, Japan, Australia, Korea, Canada, South Africa and England. Several religions are represented including Episcopal, Presbyterian, Methodist, Salvation Army, YMCA. 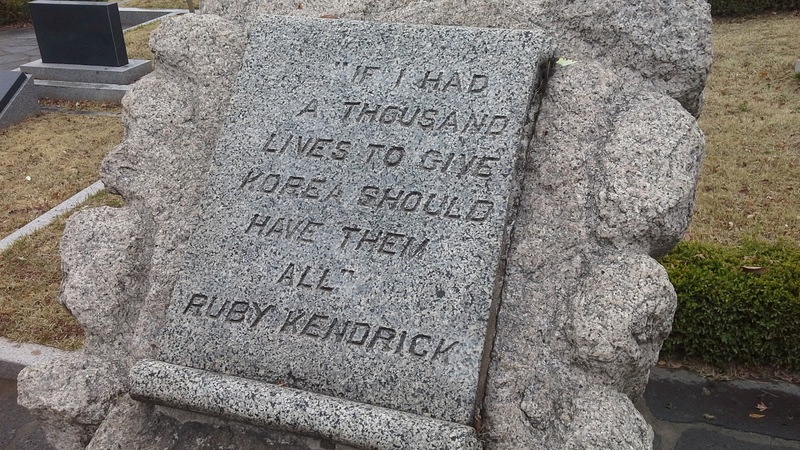 We felt such gratitude for the work and sacrifices of these brave, dear souls who came before us. 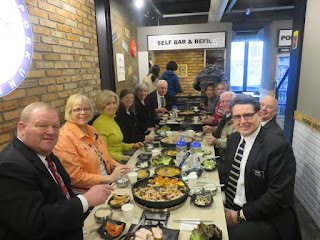 Afterwards, our friends went out to eat at a place called "Pork University." We passed on that one and headed home. Or, we dropped out of the university. 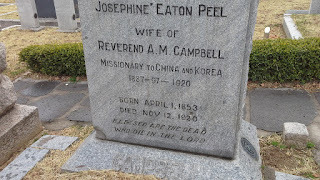 The Nielsons serve as temple missionaries here and they tell us that many members are doing work for their Korean ancestors dating back to before the time of Christ.(!) 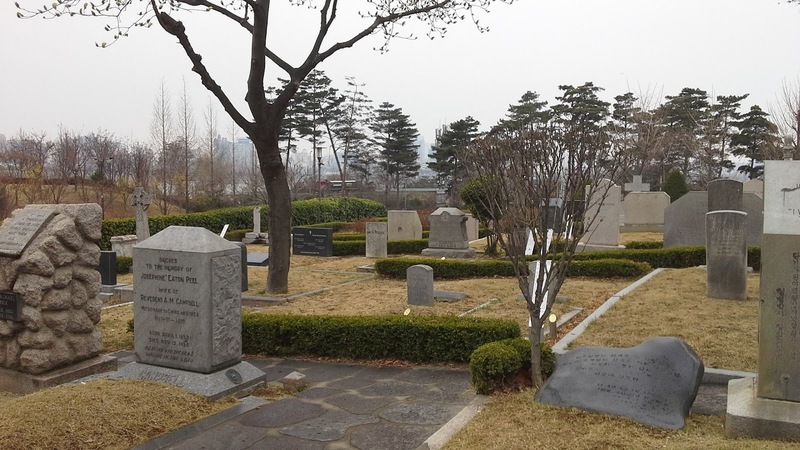 They have kept records and respect for their families through these many years.